The story behind the project Saúde Criança (Child Health in Portuguese) took off in the mid 90s in Brazil when a young woman decided that enough was enough with the country’s disappointing public health system. Working at the paediatric ward in Hospital da Lagoa, Rio de Janeiro, Dr. Vera Cordeiro saw the same tragedies day in day out. Children were being admitted to the hospital, undergoing treatment and being sent home only to turn up a a few days later in an even worse condition than before. Tragically, a few of these children even died upon their return to their local community. In order to understand this cycle, Vera took to the favelas to really get to know the reality of these children. She soon realized that their needs went well beyond just medical care. Most of her patients at the hospital came from vulnerable communities and lacked access to basic sanitary conditions, food and housing. Vera quickly understood that their well-being needed to be monitored outside of the hospital doors. It was this motive that pushed the creation of Saúde Criança in 1991; an institute to not only promote the health but also the social inclusion of the most vulnerable members of society. Driven by volunteer workers, the institution started off with humble beginnings and without a fixed methodology but with the primary purpose of always putting the children’s well-being of their work. It was also necessary to take care of the family and the child’s carers and to attend to all of their immediate needs. Dietician Cristiana Velloso was one of the volunteers to embrace Vera’s cause. When she started to learn more about the institution as a whole, she wanted to get more involved and took up a postgraduate course in social responsibility and project management. While the project was gaining traction and methodology, Cristiana became coordinator, and then operating manager, and, since 2014, she has been CEO of Saúde Criança. “I believe that we do more than help families. We transform lives,” said Cristiana, speaking about the current scope of the initiative. There are already four licensed units in Rio de Janeiro and the organization also has an established presence in Porto Alegre and Belo Horizonte. Cristina upholds that the volunteers working for Saúde Criança are its main asset: “They are indispensible, some give us a grant; others help in other diverse ways. We have someone who offers consultancy, appointments and even, donations of medicine and supplies for the training of the children’s families and their insertion in the labour market,” she said. The project in Rio de Janeiro helps 250 families monthly reaching a total of more than 1,00 people. “In all units, including the ones inspired by the methodology of the project but working under different names, we believe that more than 70 thousand lives have been transformed,” said the CEO. The results achieved by Saúde Criança are recognized internationally. However, the organization still has big challenges ahead. It has not been immune to the increasing inequality as the result of the economic and political context in Brazil over the last few years. “It became more difficult for families to have access to health care, to basic procedures such as appointments with specialist doctors, exams, required surgeries, and even, shortage of medicines that were before supplied by the government”, remembers Cristiana. Another problem is funding. It became more problematic to get funding with the crisis, which had a great impact in Saúde Criança. “Last year, we spent more than we brought in, and this year there’s no indication of improvement,” said Cristina. This complicated backdrop does not discourage Cristiana, Vera and all the net support of Saúde Criança, hoping that more organisations and companies would understand the amplitude to deal with the subject of public health in the country. 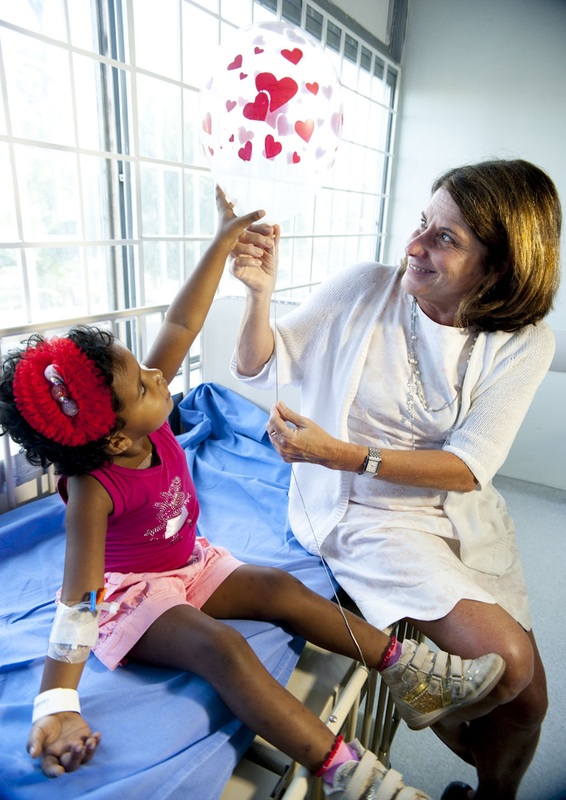 Photo: Vera Cordeiro – Founder & Chairwoman of the Board of Director at Associacao Saude Criança with a little girl.